Our family is a competitive bunch. Years ago, before we had started dating, my husband and I worked in the same office. But, instead of getting files off our desks, we would race each other to see who could finish the daily crossword puzzle first. Usually, I won. Okay, I admit that I cheated by calling my Mom fairly often...but hey, a win is a win. My husband hates losing so much that I once saw him chuck his club into a creek on a putt-putt course. And, when he coached our daughter's t-ball team a few years ago, and they lost their first game...well, it wasn't pretty at our house afterward. Though, he at least waited until our daughter walked out of the room before he said he was so mad that he felt like throwing something. His mood actually rises and falls with the score of his fantasy football team. The latest competitive activity in our house is Speed Stacks. If you haven't seen it, you should watch this. Not only do you need dexterity and coordination, you need to be fast. They don't include a timer for nothing. As of now, our daughter is the quickest, but we're gaining on her. Well, my husband is. I can't cheat my way to winning this. Apparently, our five year old son is starting to take after his Dad. Because the other night, our boy stopped playing, grabbed at his pants, and as he ran to the bathroom, he yelled, "I'm going to go pee! TIME ME!" Tomorrow is my daughter's ninth birthday. Unlike a lot of parents, I can't look back on the day of her birth as the happiest day of my life. Instead it was terrifying. Terrifying, because tomorrow is December 29th, and she was due March 10th. I went to the hospital for a routine ultrasound and my doctor didn't let me leave. To say the least, the experience wasn't all sunshine and butterflies. Okay...I'm not saying labor and delivery is sunshine and butterflies. It's more like torture and gore. But, at least if you deliver a full-term baby you have a pretty good idea whether or not your kid is going to live. When you have emergency surgery, more than ten weeks too soon, and your 2 lb. 9 oz. baby is whisked away to have a breathing tube put down her throat, you're not real sure what the future holds. One of her preemie diapers. She didn't wear the apple...it's just to give perspective. We were some of the lucky ones. After five weeks, and after gaining a pound-and-a-half, we brought her home. That teeny, tiny baby? Well, she was a fighter. That sure hasn't changed much, though now she mostly just fights with her brother. She's nine, going on nineteen. We still can't be sure of what the future holds, but one thing's for sure...this sweet daughter of mine is (aside from that fighting with her brother stuff) pure and unequaled perfection. Her heart is so big, I don't know how it fits in her chest. And, though the day of her birth was the scariest day of my life, she's given me sunshine and butterflies ever since. Happy birthday baby girl! I just finished reading the latest copy of U.S. News & World Report. This is simply one indication of my age. Not only do I read it, I subscribe to it. I am old. The cover story in this latest issue is 50 Ways to Improve Your Life in 2008. Here are a few of their suggestions...and what I think of them. 1. Try open water swimming. Just a few days ago, I read about Vibrio Vulnificus, a bacteria found in salt water which can invade any open sore on your body and lead to amputations and death. Open water swimming? I think not. 2. Cut back on corn. Had they said this would improve the life of my sewer line, I might have bought it. 3. Waltz your way to better fitness. And where exactly will I find someone to waltz with? Unless Tony Romo was his dancing partner, my husband would rather stick hot needles in his eyes. 4. Give a healthcare giftcard. This seems nothing more than a slap in the face. "Hi. You seem old, sick and frail and I doubt you'll be around to blow the candles out on your cake next year. Here's a little something to help pay those doctor bills. Oh, and happy birthday!" 5. Read an international newspaper. I have a hard enough time reading what the American media has to say, do I really need to cross a border for more of the same? Oh! Okay! Just like that. 7. Avoid recalls. Make your own toys. Ingesting lead would hurt my children less than the toys I would make. 8. Avoid air travel delays. Getting that raise would be easier. 9. Knit like a hipster. What does that even mean? What am I supposed to knit? A peace symbol? A poem? A beatnik afghan? 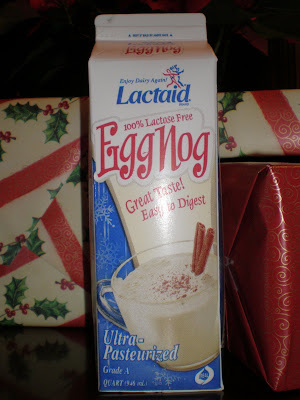 How sad is it that I wanted to jump up and down in the dairy section, when I saw that Lactaid makes Egg Nog? I just told my daughter that I needed a cheery and light-hearted idea for a blog post. I mentioned that things get chaotic this time of year, and people may need something to make them stop and smile. I told her that talking about my stress and poor eating habits wouldn't qualify as light-hearted. I’m thinking she doesn't quite get what I'm going for. I just heard The Twelve Days of Christmas on the radio. I'm pretty sure that most people would want gift receipts on everything but the five gold rings. There isn't any doubt that a bunch of people leaping, dancing, drumming, piping, and milking would drive me more crazy than I already am...and I can't get much crazier. And, who in their right mind wants 23 birds? I took my kids to a children's Christmas party on Sunday afternoon. All the kids were called to sit on Santa's lap, sing Jingle Bells, and eat candy canes. But, the stress must really be getting to Mrs. Claus. Because after bending down and talking to all the boys and girls, she stood up, turned around, and asked, "Can someone please get me a Bloody Mary?" You Want Meepballs With That? I wasn't feeling well last night, so my husband offered to get some take-out for dinner. He then asked our five year old son what he wanted to eat. Then he corrected himself and said, "No, no, not pasketti. Sasketti." And again, "No! Not sasketti. I want Spapetti." We were just sitting there, waiting for him to come up with the right word, when he walked over to my husband and said, "Dad, I want chicken". "You surprised to see us, Clark?" "Oh, Eddie... If I woke up tomorrow with my head sewn to the carpet, I wouldn't be more surprised than I am now." "Oh Aunt Bethany, you shouldn't have done that." "Oh dear, did I break wind?" "Dad, this tree won't fit in our back yard." "It's not going in the yard, Russ. It's going in the living room." "Our holidays were always such a mess." "How'd you get through it?" "I had a lot of help from Jack Daniels." "It's the Christmas star, and that's all that matters tonight. Not bonuses, or gifts, or turkeys or trees. See kids, it means something different to everybody, and now I know what it means to me." At last night's Hanna Montana/Miley Cyrus concert there was an opening act called The Jonas Brothers. They are a trio of modern-day, slightly-punkish-yet-Donny Osmondesque, teen boys, who were met with ear-piercing screams from 15,000 girls. That's one thing that will never change. Whether it's Frank Sinatra, Elvis Presley, The Beatles, or for crying out loud...even Leif Garrett...there will always be screaming girls. But, one thing was very different. Because, as The Jonas Brothers gathered together to sing a slow song, they didn't ask the audience to pull out our lighters and hold them up in the air. They asked us to pull out our cell phones. Instead of flickering flames courtesy of Bic, the arena was filled with dim, blue light courtesy of Verizon. Last night we surprised our daughter with Hanna Montana tickets. It was an early birthday present that we thought she would love. For anyone without a pre-teen daughter, Hanna’s real name is Miley Cyrus…as in Billy Ray’s daughter. Now, if you had asked me ten years ago if I would ever go to a concert with the name Cyrus on the ticket, I would’ve told you absolutely not. As a matter of fact, when my husband and I got married back in 1997, we specifically told the DJ that Achy Breaky Heart was NOT to be played. But, our daughter LOVES this Cyrus kid. So we were pretty surprised with she opened her present and just sat there and smiled. No yelling? No jumping? No bouncing off the walls? WHAT? Because, when I wasn’t much older than her and I got Jack Wagner tickets…well, I was a mini-maniac. And, when he touched my hand at the concert...sigh...I vowed to never wash it again. But, our kid was calm and we just sat there looking at her, asking if she was happy. Prodding her to at least pretend to be thrilled. I gotta tell you, I was a bit disappointed. When I took a phone call a couple of minutes later, she was still just sitting there. But, slowly it hit her, and I looked over to see her eyes welling up with tears. Then she took a pillow, put it over her face and screamed. Soon she was jumping around the room, giving me and her Dad alternating hugs, with, “Thank you! Thank you! Thank you!” in between. She ran upstairs, tried on an outfit for the concert, then hugged her Hanna Montana poster. What a relief that was. I can’t tell you how happy I was to see her acting like a hysterical fool. A few nights ago, my kids were in the bathroom and suddenly things got quiet. Now, every parent who knows anything, knows that silence is not golden unless you're in the car, where everyone is safely strapped in their seats. Silence in the car isn't golden, it's platinum. But, silence in the bathroom is not usually good, so I don't know why I didn't yell the frequently asked, "What are you doing in there?!!" Before I could use my motherly instincts to sense doom, my daughter yelled, "Mom! You're not going to be happy." Now, what could that mean? Coming from the bathroom, I assumed it was that my son had pulled down the towel rack, or that a full trash can had been tipped over. The worst scenario in my mind was a backed-up toilet. We live in an old house, so that happens a lot. But,no! That would just require a plunger and some elbow grease. Instead, my daughter informed me that after she had pooped and wiped, but before she had flushed, her brother threw an ink-pen in the toilet. At first, I just stood there looking at it. Like, what am I going to do about this?!! But, I quickly went to work, looking for something with which I could easily retrieve the pen, and then dispose of. I thought about tongs, but tongs aren't really disposable. I thought of the box of surgical gloves we have, that I use for projects around the house, or for when my son had his tonsils removed and we had to shove acetaminophen suppositories up his patootie, but they seemed too thin and I didn't want to think about sticking my hand in there. Not even with a glove on. So, I did what any logical person would do. I took two bendable straws and positioned one under each end of the pen which had luckily not speared anything. With a keen sense of straw-balancing, I was able to lift the pen out of the pot. I threw it, and the straws, into the trash can I had placed right next to the toilet. And, there you have my latest Mommy-Invention. A poopy-pen-retrieval-system. It sure won't make me rich, but at least it kept my hands clean. Since I've been working, a few changes have been made around the house. The biggest of which, is that my husband now gets our son ready in the morning. The other day, I mentioned to my husband that he needs to make sure our son is getting himself dressed...and not to help him too much. Even though he's five years old, he had a rough start in life, and is still behind on some of his motor skills. He needs consistent practice in order to master every-day tasks. My husband admitted that he had been helping our son get his clothes on, because he's usually pressed for time. But, that afternoon when I picked up my son at school, I saw that our boy had indeed dressed himself. Though, I'm guessing they were running late again...and that my husband never noticed that he sent our kid to preschool with his pants on backward. Maybe Baby should try to find the rest of her face.